Our breakdown of who and what to see during the jam-packed festival. Speaking of wristbands, there are some potentially complicated options you’ll have to weigh before delving into the individual sections of the NXNE schedule. There are separate wristbands available for the film, music, and comedy programs, but all of them will gain you entry to the art exhibitions. While the music wristband will get you into comedy shows, it doesn’t work the other way around. There are also specific badges that can be purchased for the interactive and art components of the festival: the interactive one will get you into the art, but the art badge won’t provide access to the interactive. Got that? Of course, if it’s all too confusing, you may just want to invest in a platinum badge that gets you into everything. Once you’ve got all of that figured out, here are some things to keep in mind to help you get the most out of whatever decision you make. Enjoy the outdoors: Now that we’ve finally got some good weather, don’t let it go to waste. 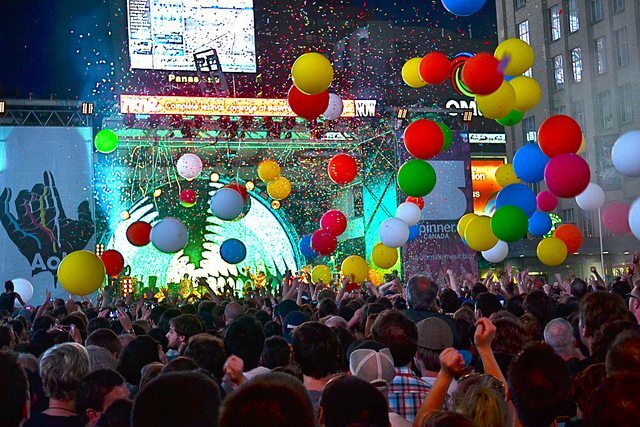 Even if you attend only the shows at Yonge-Dundas Square—like Danny Brown, Spoon, or Juicy J—you’re still likely to have a great NXNE experience, and one that will cost you absolutely nothing. If you do have a music wristband or a platinum badge, though, and love sunshine, don’t miss the House of Vans show at Vice Island (actually Toronto Island, at Artscape Gibraltar Point) on June 19, with acts like Future Islands and Pusha-T.
See at least one artist you’ve never heard of: We know the idea of getting to see all these great musicians you love perform is exciting, but think about the acts you just don’t yet know you love. The only way to discover a new obsession is to wander into a venue some night and let fate take its course. Just make sure to tell all your friends and then remind everyone that you were on the bandwagon from the very start when the band gets big. Pace yourself: It’s a long festival and, though the later last calls may be enticing, you don’t want to exhaust yourself in one hedonistic night and miss out on some good shows because you can’t get rid of that hangover the next day. Instead, stay hydrated, and bring snacks along to fight any hunger pangs as you breeze from venue to venue without tiring. Then wake up ready to do it all over again. Now dive into our genre-by-genre picks of the best the festival has to offer.